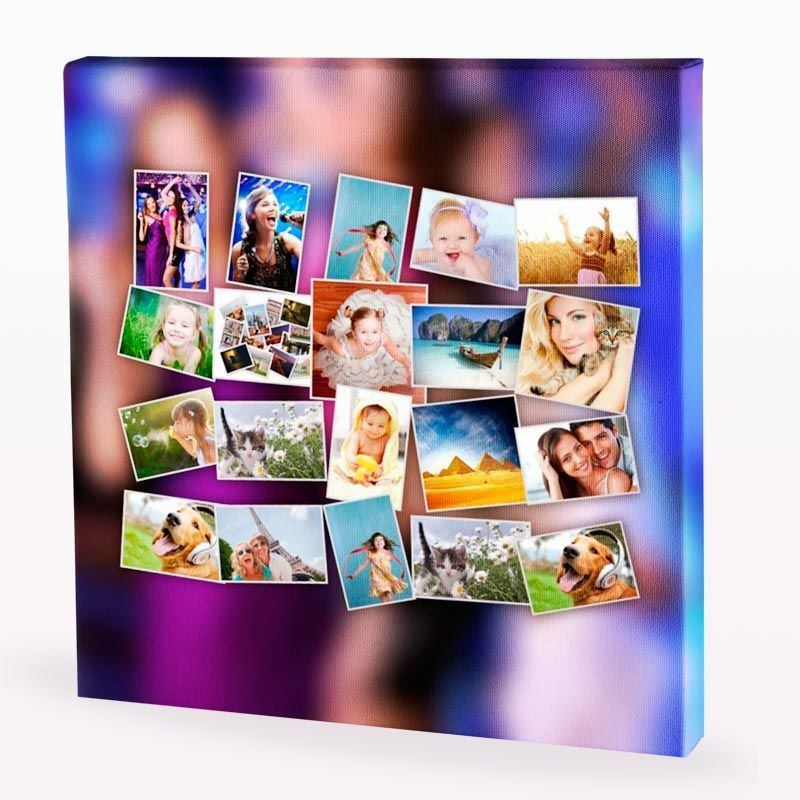 Design your own beautifully arranged photo montage canvas, using our online design tool. Create stunning collages of friends and family or memories from special events, which can be hung in your home and cherished forever. Our design interface will automatically create a collage in the style you choose, which you can manually edit and get creative with. 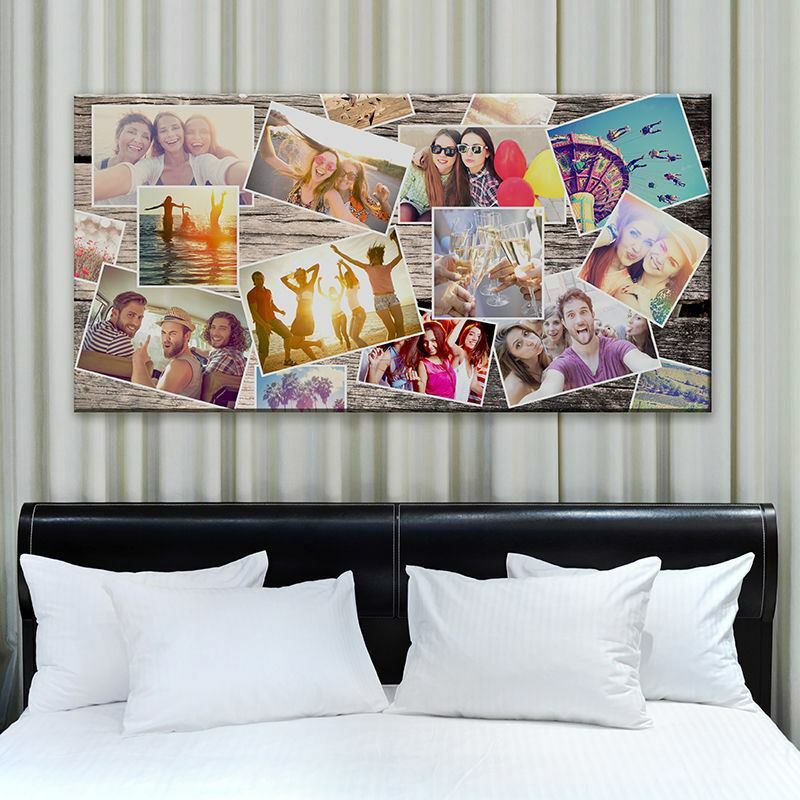 A photo montage canvas is a stylish way to display a variety of photos creatively, whether they’re a gift for a loved one or to hang in your home. We print and produce all your canvas montages onsite in the UK, using a professional level printing process to create fresh and vibrant prints. Bring a personal touch to your photomontage ideas with our fun and contemporary collage options. Your print will be hand-stretched on a custom-made frame, created using sustainable wood. Our FSC approved pinewood is robust and warp proof, so your photo montage canvas won’t split or crack over time. We create prints that last; every purchase you make comes with a lifetime guarantee, to keep you satisfied for years to come. You can easily design your photo montage canvas print using our online tool, which automatically arranges your photos in a variety of styles. You can manually add more images, photo filters, or text to enhance your print. Simply upload as many photos as you wish, and you’re ready to go. Choose from an unbeatable range of photo montage canvas sizes to display your striking designs on. Large scale photo montage canvas prints can make a stunning statement when you enter a room! Available in sizes from 30 cm up to 200 cm. For canvases up to 150 cm you can choose from two depth options; 2.5 cm for a lightweight yet sturdy frame, or 4.5 cm for a deeper frame with extra strength. For montage collages over 150 cm, your frame will come in a 4.5 cm depth for added stability. Your canvas montage designs are printed on a heavy, 300 gsm woven canvas which has a delicate grain texture on the surface. The durable material is created from 100% poly so it remains strong throughout the years, unlike pure cotton. The soft material is perfect for preserving your designs with an even and consistent texture. Our makers craft every canvas frame on site in the UK, using only sustainably sourced wood. The laminated pinewood is strong and robust and will prevent your frame from splitting, cracking or warping over time. We use 8 canvas wedges rather than the typical 4, to keep your montage photo canvas perfectly tensioned after it has been hand-stretched. Sublimation dying creates a beautifully vibrant print by using heat and pressure to secure the inks straight into the canvas fibres, rather than just laying them on top. The result is a durable and richly coloured photo montage canvas, which is completely scratch proof and washable. Even if you decide to use black and white photos, expect an even tone with sharp detailing. Your montage photo canvas will have a contemporary matte finish with a slightly grainy texture, and no plastic coating on top. Keep your design looking fresh and vivid by keeping it out of direct sunlight. Our methods and products are created with an eco-friendly approach. All of our inks are environmentally friendly, and our wood is sustainably sourced to reduce our carbon footprint. Our design tool gives you the option to choose from a variety of different wraps, which is what the edges of your montage canvas prints will be filled with. Select your wrap option when you click “Start Design”. Check our design tips below to ensure you select the perfect wrap to enhance your image. We offer a gallery wrap where your image extends over the canvas edges, a mirror wrap where the design is reflected, a chic coloured edge wrap or no wrap. To hang your montage canvas prints with ease, use the free wall hanging kit which is provided with every purchase. Affix the picture hook to the back of your new canvas frame, and hang wherever you choose. The kit includes a picture hook, screws and wall plugs. Montage collages on our blurred background option look particularly good with a gallery wrap. If your montage canvas print doesn’t have a border and there are important details near the edges of the image, you may prefer to use a simple coloured wrap for your montage canvas prints. Simply select the coloured option and place your images directly in the template. The bleed is the area on the template where leeway is left for the printing process. The bleed area will usually be cut off so don’t include any important parts of your photo in this area – however, it may still end up on the final print so make sure it is filled with part of the design. Various photo montage ideas can have completely different effects on a room. If you’re wanting to create a heart-warming gift to celebrate a friend’s birthday, you could use the ‘scatter’ option to display multiple photos of the two of you in the shape of a heart. Alternatively, a montage collage can be an excellent way to display images from a special event which you’ll always want to remember. You can even add extra details such as certain dates or locations by selecting the option to add text. Create a focal point in a room by displaying personalised montage canvas prints on wide wall space. Colourful canvas montages look particularly striking against a sleek white wall and will capture any visitors’ attention. Smaller canvas montages make great gifts – how about designing a pet montage for your family to lovingly display in their home? The opportunities are endless, particularly with our customisable design options. Take full control of your design by selecting the ‘do it yourself’ option. Arrange your photos with no limits, with the option to add text and other borders. Let your imagination take you away! If you’re after a structured design, try one of the ‘scatter’ options which will automatically arrange your images in a fun and creative way, with different background possibilities.